Recommended for new designs: This product (or a similar replacement with a compatible form, fit and function) is estimated to be available for ten years or more. 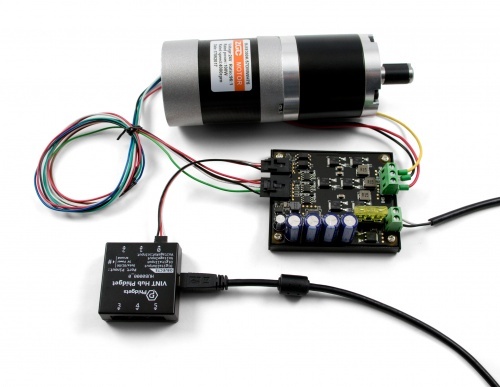 Control a brushless DC motor from your VINT Hub. The hall effect input enables easy position and velocity control. 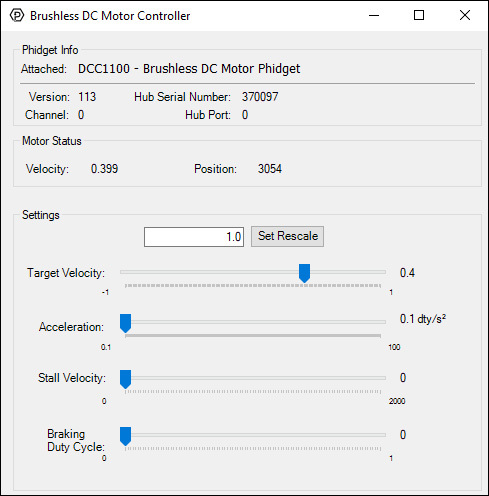 Brushless DC motors have several advantages over their brushed counterparts: They have longer lifespans, run quieter, and have built-in position control thanks to the hall-effect sensor that tells the controller which coil to activate. Based on this feedback, the controller selects which coil to activate, which causes the rotor to be pulled into place. 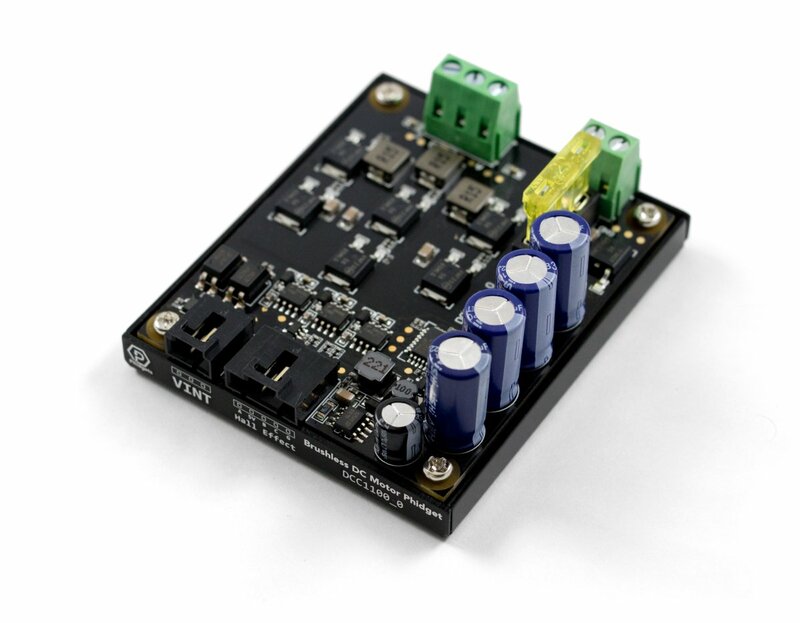 The DCC1100 requires a 8-30V DC external power supply and can control one brushless DC motor. The motor must have hall-effect feedback for this controller to function. This controller connects to a port on your VINT Hub (see the Connection and Compatibility tab for a list of hubs). In software you can either control the motor velocity, acceleration and stall velocity directly, or you can use the PositionController object to set the motor position using our closed-loop PID controller. For more information on how to use and configure the PositionController, take a look at the technical section of the DCC1100 User Guide. An on-board temperature chip is accessible via the TemperatureSensor object, so your program will be able to watch out for overheating. The VINT port is electrically isolated from the rest of the board, making it simple to build a Phidgets system without having to worry about ground loops or damage to your hub or computer. A fuse is included on-board for safety in case of power surges. Use a Phidget cable to connect this device to the hub. You can solder multiple cables together in order to make even longer Phidget cables, but you should be aware of the effects of having long wires in your system. Using motor controllers with large motors can pose a risk for your power supply. If your supply does not have protective features built-in, you can use a Power Guard Phidget to prevent damage from power spikes from back EMF that is generated when motors brake or change direction. We recommend that you use the SAF2000 for any motor with a current rating between 1 and 5 amperes, and the SAF1000 for motors above 5A. We offer a wide variety of BLDC motors that can be used with this Phidget. For wiring details, see the Connection & Compatibility tab on the motor's product page. This controller is only compatible with BLDC motors that have hall-effect sensor feedback. This Phidget requires a power supply between 8 and 30V DC. Select the power supply from the list below that matches your region's wall socket type. These cables are normally used to connect encoders to Phidgets, but the same connector is used by the hall effect input on the DCC1100. The BLDC motors sold at Phidgets already have this cable soldered to the end of the hall effect wires, but if you have your own motor you can buy one of these cables. Just snip one end off and solder it to you motor's hall effect wires in order to connect it to the DCC1100. Connect the DCC1100 to the VINT Hub using the Phidget cable. Connect the motor to the Phidget's output terminals. 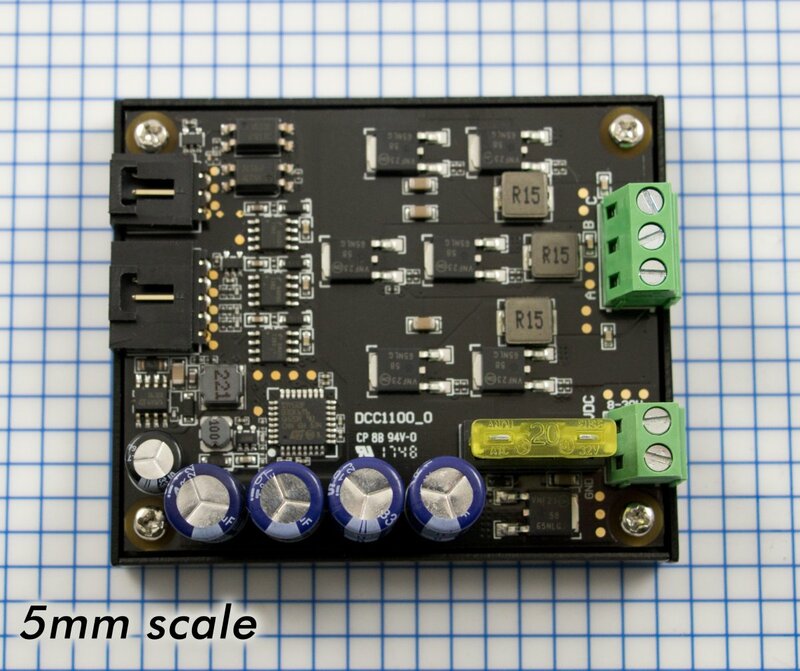 See the datasheet or product page for your motor to determine wiring. Connect the VINT Hub to your computer with a USB cable. Connect the motor's hall-effect wires to the 5-cable port on the DCC1100. If you didn't get your motor from our website, you'll want to solder half of a 3019 Cable to the end of the hall-effect wires. Connect the power supply to the power terminals. Now that you have everything together, let's start using the DCC1100! In order to demonstrate the functionality of the DCC1100, the Phidget Control Panel running on a Windows machine will be used. The Phidget Control Panel is available for use on both macOS and Windows machines. To open the Phidget Control Panel on macOS, open Finder and navigate to the Phidget Control Panel in the Applications list. Double click on the icon to bring up the Phidget Control Panel. Linux users can follow the getting started with Linux guide and continue reading here for more information about the DCC1100. Serial number: allows you to differentiate between similar Phidgets. Channel: allows you to differentiate between similar objects on a Phidget. Version number: corresponds to the firmware version your Phidget is running. If your Phidget is listed in red, your firmware is out of date. Update the firmware by double-clicking the entry. 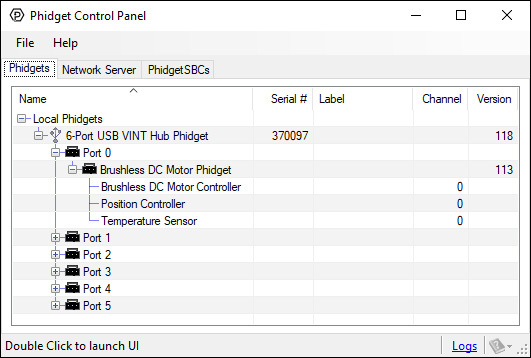 The Phidget Control Panel can also be used to test your device. Double-clicking on an object will open an example. Brushless DC Motor Controller: Controls the velocity and current of the motor. Position Controller: This object controls the position of the motor using the hall effect sensor in the motor. Temperature Sensor: Measures the temperature of the DCC1100 so you can tell if it's overheating. Change the motor speed by dragging the Target Velocity slider from -1 (maximum speed reverse) to 1 (maximum speed forward). You can see the updated Velocity and Position of the motor near the top of the window. Use the Acceleration slider to change how responsive the motor is to changes in Target Velocity. Use the Stall Velocity slider to control when the controller detects a stall. For more information, visit the API. Use the Braking Strength slider to determine how powerfully the motor will try to hold position when it is stopped. For more information, visit the API. Set the Rescale Value to change the position units, which is useful for converting to degrees or RPM. See the technical section of this guide for more details. Note: a video describing the use of this program is available below in the Technical Details section. It is recommended to set the Rescale Factor first. This will change the units of your controller. For information on the rescale factor, visit the technical details section below. You can set the control parameters Kp, Ki and Kd in order to change the behavior of the control loop. You can save these variables into the program so you don't have to re-enter them manually (NOTE: This does not store the settings on the DCC1100, it simply saves them inside the control panel program, so you'll have to re-enter them if it's used on another computer). The Velocity Limit and '"Acceleration can be set in the top right. These values will be used to create a motion profile that the controller will try to track. Use the Deadband to determine how exactly the controller will try to reach the target position. View the API for a detailed description of how Deadband works. Click on Show Other Motor Settings' to access Stall Velocity. This is a safety feature which protects your hardware. View the API for a detailed description of how Stall Velocity works. 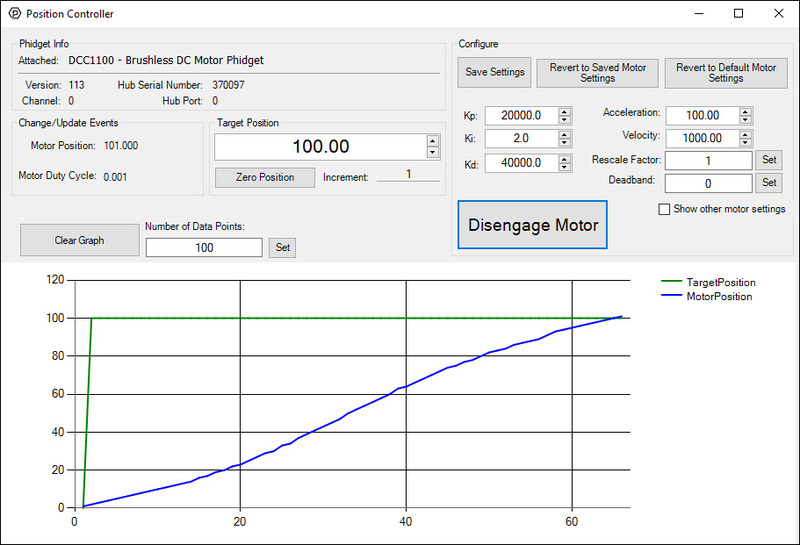 Change the Target Position to select which position you want the motor to try to reach. Press the Engage Motor button to allow the motor to start, and press again to stop it. You can Zero Position to add a position offset which will return the motor's position to 0. You can view the control data on the graph. The green line is the selected target position, and the blue line is the motor's actual position as reported by the Hall Effect sensors. When the two lines meet, the motor will stop moving and attempt to hold that position, even if moved by an external force. You can Clear the graph, and customize the number of data points shown at any given time. Modify the change trigger and/or data interval value by dragging the sliders. For more information on these settings, see the data interval/change trigger page. The measured temperature can be seen next to the Temperature label. Cover the board with your hands to see the temperature quickly rise. Before you can access the device in your own code, and from our examples, you'll need to take note of the addressing parameters for your Phidget. These will indicate how the Phidget is physically connected to your application. For simplicity, these parameters can be found by clicking the button at the top of the Control Panel example for that Phidget. In the Addressing Information window, the section above the line displays information you will need to connect to your Phidget from any application. In particular, note the Channel Class field as this will be the API you will need to use with your Phidget, and the type of example you should use to get started with it. The section below the line provides information about the network the Phidget is connected on if it is attached remotely. Keep track of these parameters moving forward, as you will need them once you start running our examples or your own code. This Phidget is compatible with the BLDCMotor Examples, the MotorPositionController Examples, and the TemperatureSensor Examples. Once you have your example, you will need to follow the instructions on the page for your programming language to get it running. To find these instructions, select your programming language from the Programming Languages page. Rescale factor can be set in order to change the units of the motor's position into something more useful, such as degrees or rotations. The following video explains how this is accomplished using a stepper controller as an example. 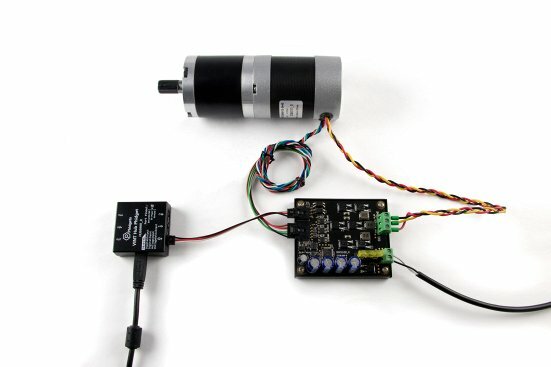 Instead of "steps", brushless DC motors work in "commutations". The number of commutations per rotation is equal to the number of poles multiplied by the number of phases. So if you have an 8-Pole, 3-Phase motor, it will have 24 commutations per rotation. In this case, you could set the rescale factor to 1/24, or 0.0416 in order for target position to be measured in rotations instead of commutations. In order to get the desired behavior from your controller, you will have to tune your control parameters. This video explains the tuning procedure and gives information on how the controller works. For specifications that deal with acceleration and velocity limits, see the API tab.